Jason Bateman finally ups his big-screen game with this winning story of suburbanites in a not-so-trivial pursuit. It’s a setting ripe for spoofing. Competitive board games and trivia. Highly competitive. 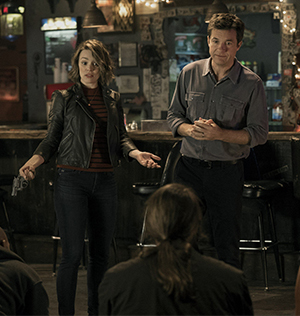 Here, Max (Jason Bateman, TV’s Arrested Development) and Annie (Rachel McAdams, Sherlock Holmes: A Game of Shadows) meet cute in a pre-title sequence involving trivia, beer and a wild ride home on the subway. They become the perfect couple, switching their game from competing against each other to becoming the ultimate tag-team in the game of life (figuratively, not necessary in the board game sense). As the ol’ expression goes, it’s all fun and games until someone gets killed... or gets a bullet in the arm and bleeds all over the neighbor’s dog while snooping on said neighbor’s computer. And said neighbor is, of course, a police officer. In this case, the stakes are raised even higher when Max’s brother, Brooks (Kyle Chandler, Argo), comes to town and, in the spirit of one-upmanship, stages a murder mystery party like no other when he himself becomes the victim of a very real kidnapping. Game Night works so well for a number of reasons. It’s got the always likeable Jason Bateman, finally in a really good big-screen comedy that ditches the crassness of outings like Horrible Bosses (and its sequel) and Identity Thief in favor of lots of character-based humor. But, yeah, this one earns its “R” rating. And Game Night also has Rachel McAdams, in her most playful role yet. But there’s also a supporting cast of friends that keep the laughs coming from a number of different angles. For one, there’s the idiot friend, Ryan (Billy Magnussen, Ingrid Goes West). Ryan has a thing for dating dumb blondes, dumb brunettes, dumb redheads. He ain’t too bright himself, so when he picks up a British woman who knows how to hold a steady job, he’s out of his league. There’s also Gary (Jesse Plemons, The Post), the next-door neighbor whose girlfriend left him, which in turn left him out of the game night circle. It doesn’t help matters that he’s a little on the creepy side. As these characters — and more — match wits in a murder mystery gone horribly awry, the situations get ever more ridiculous, but without inciting the urge to smack the forehead. It’s too much fun watching these guys get it all messed up. Considering how wildly enjoyable Game Night is, it’s almost disconcerting to consider its provenance. The screenplay’s by Mark Perez, of Herbie Fully Loaded and The Country Bears “fame.” A piece of trivia on his IMDB bio notes he was an inaugural member of The Disney Writer’s Program. Well, Uncle Walt should be proud. And Game Night’s directed by John Francis Daley and Jonathan Goldstein, the tag team behind Vacation, the 2015 attempt to reboot the Griswold family saga. So, this is all the more reason to cheer on Game Night. This farce augurs future films of fun and games, or, at the very least, the hope thereof. Throughout Game Night, there’s an appropriate level of playfulness afoot, right down to a very clever use of tilt-shift photography to scale down some real-world settings into a game board-like appearance of plastic people, trees, cars and houses. Aside from the characters, the absurd situations and the numerous movie references (Terminator, Taken 3, The Incredible Hulk and others), the big surprise is the movie has quite a bit of heart. A subplot involves Max and Annie as they grapple with trying to get pregnant — while acknowledging it could very well mean the loss of their freedom to play games. With some of the quips and gags getting drowned out by laughter, Game Night proves to be one comedy worth playing again.